Happy NTT, friends, and happy October! I have been swamped around here with several memory quilts, and haven't taken any time at all to just sew for fun in the past week (still working on that balance thing). I have an idea for a quilt using my scraps, and I'm hoping I get to play around with it a little bit in the next couple of days. So, let's get right down to the highlights from last week's party! This Gravity quilt by Myra at Busy Hands Quilts is just stunning (you know I love a rainbow)! 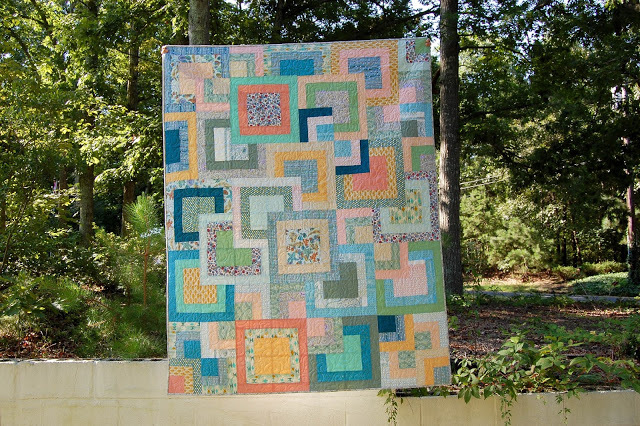 Jessie from Measuring Success linked up her Stacked Squares quilt and I love the color palette. This is such a fun illusion. 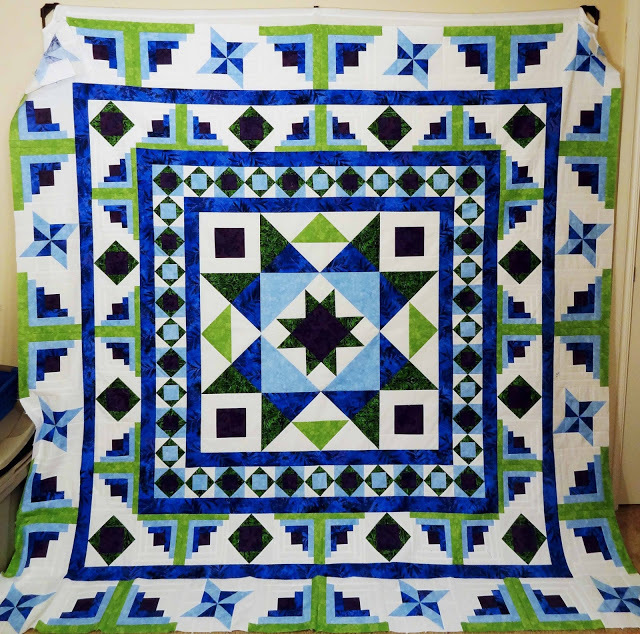 and finally, I couldn't resist this pop of green and blue in this medallion quilt by Kate at Life in Pieces. Wow, how'd I miss that medallion quilt. Just gorgeous. Hope you get some "just for you" sewing time soon Kelly! Beautiful quilts. I have to say that I didn't quite realize that this was a Thursday linkup. I got it confused with the WIP Wednesday over at The Needle and Thread Network. Brain just kicked in, and I realize these are two very different things. Wow, it's always such a nice surprise to open a post and see one's project somewhere else. Thanks for the quick grin this evening. Hope you get a chance to play with your scraps soon. Balance is tough to achieve, but I think just realizing the need or lack thereof is a big step towards reaching it. I hope you get some quality fun quilting time soon! Thank you for featuring my GRAVITY in this post! I too am making memory quilts - from mens shirts in a checkerboard fashion. I love the business but do need fun projects thrown in too. So glad you recap quilts that were linked. I missed last weeks and these were very inspiring. Thanks, Kelly!